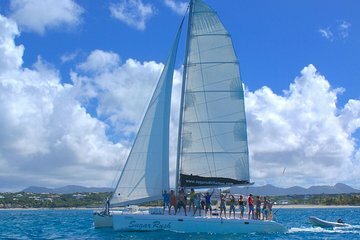 Explore the waters of St. Maarten and Anguilla without the hassle of navigating on a full-day boat tour with hassle-free round-trip transport from your accommodation. Going with a guide ensures you visit the best locations for swimming, snorkeling, and relaxing out on the water, from Creole Rock to Rendezvous Bay. Breakfast, lunch, and an open bar are included your comfort and convenience. My wife and I booked two catamaran islands tours and this is by far the best. The Sugar Rush was a very comfortable boat with lots of shade after a long day in the sun. Lizzy, the host, was extraordinary! 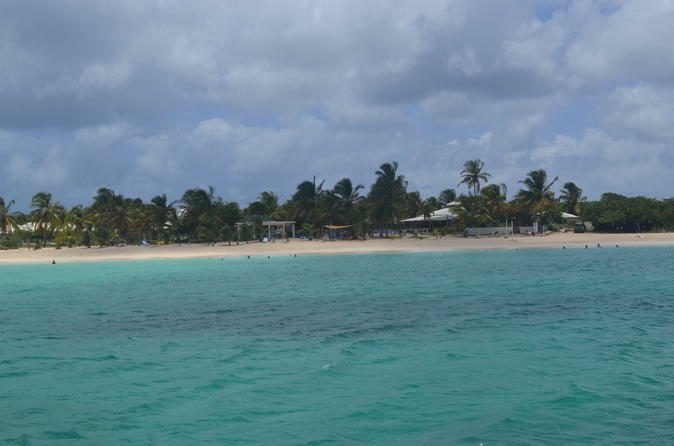 Food, snacks and drinks were fantastic and Anguilla is the best! I would highly recommend this tour. We had a great day aboard Sugar Rush! It wasn't too large of a group maybe 12 people and it was a great value! When we boarded the boat, they had coffee and pastries. They had a well-stocked bar all day with not only beer, rum punch and water/soda, but also vodka and rum w/ various mixes. The lunch on Anguilla was fabulous - ribs, chicken, mahi with salad, rice and beans. The crew was incredibly attentive. We had a nice snorkel stop at Creole Rock and another nice swim after lunch on the way back. I would definitely book again and recommend it to friends. Wonderful day trip!! Very enjoyable and laid back, Captain Andre and Lizzy were fantastic! One of the highlights of our entire trip to St. Maarten!! The water was crystal blue, the sunshine was out and the breeze was blowing for our trip. The music selection was fun and the drinks were plentiful. We skipped the snorkeling and just swam at the beach on Anguilla, the water is SO clear and blue, just breathtaking! The other passengers were fun and lively and made the trip very entertaining!! Thank you so much Sugar Rush staff for such a memorable adventure! !